This dish is easy to make, especially when using pre-packaged cooked meatballs which can be found in random desi stores (I use the Al-Safa brand). However, here’s how to make the meatballs if you can’t find the ready-made ones. Spices: turmeric, chilli powder, cumin, coriander powder, salt to taste. 1. Wash the minced meat thoroughly draining out all the blood until the meat turns pink. Let it sit for a few minutes to allow for any excess water to drain off. 2. In a bowl, mix the minced meat, a handful of chopped fresh coriander, 1 egg, and only 1/2 tsp of cumin, 1/2 tsp coriander and 1/4 tsp of turmeric and mix well together. Add just a pinch of salt. 3. In a pan, heat up about 4-6 tablespoons of cooking oil. 4. Once the oil is hot enough for frying, gather a bit of the mixture in your hands and roll into a ball. The mixture should make about 20 medium sized balls. Fry all the balls until golden brown then move aside. (Frying them for the right amount of time means they won’t fall apart when you place them in the massala). Note: If you are planning to prepare the kofta/meatballs beforehand so you can make the curry at a later date, this is where you would stop. You can keep the kofta in the refrigerator or freeze them for however long you need to. To make the massala: Make the massala as you would for any curry. The method is always the same! 5. Dice 2 onions finely and fry in about 2 tablespoons of oil. When the onion starts to brown, add some finely chopped garlic. (If you have a blender, you can fry 1 onion and blend the other along with the garlic and add to the already browned onion). 6. Add 1 tsp each of cumin, coriander, chilli powder, turmeric and salt and stir well. If you want to make the dish a bit spicier, add a little more chilli powder. 7. Chop up 1 tomato and add to the mixture. Fry for 2 minutes then add 1 cup of water and blend into a paste. Continue to cook on low heat until you have a nice thick massala. Note: You should by now have enough quantity of the massala to make the perfect curry. Make sure the massala isn’t too dry nor too liquidy. Play around with it until you get the quantity you need. To make more massala from the get go – add more onion. 8. Add the prepared meatballs and coat in the massala. Let simmer for 10 minutes with the lid on then remove from heat. 9. Add some fresh chopped coriander/cilantro for decoration and flavour. Recommendations: Best eaten with hot white or brown basmati rice. 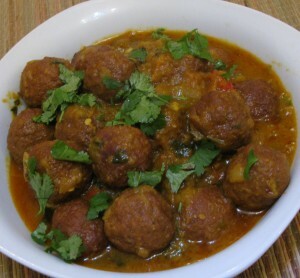 I have been looking for a good Kofta Curry with meat balls ever since I left UK. This may be the one. About this recipe and Kofta, there is no egg to be used- as an old wise Afgahnish Friend of mine has told me. Thought I pass the word.